Posted Wednesday, June 19th, 2013 by Greg Gladman. Tried and tested tips for removing stubborn ink and toner stains. If you are someone who frequently changes your ink cartridges and toner, whether it is at work or at home, unfortunate accidents are bound to happen when dealing with these kinds of staining liquids. We’ve all been there―you’re in the middle of switching out an old cartridge with a new one when suddenly, your hands slip and there is a large blot of ink or toner now wreaking havoc on your carpet. Unfortunately, due to the viscosity of ink and toner, these liquids are some of the more difficult stains to remove, especially from light colored carpet. This is why many people typically begin panicking and frantically scrubbing at the stain in an effort to mop it all up, rather than taking a moment to figure out the most effective method of strain removal. However, not following proper cleanup methods can actually create more of a mess and damage to your carpet than before. Luckily, there are a few helpful household products that can help to easily remove printer ink and toner stains from your carpet as long as you are able to treat the stain right away. The longer you leave the stain to sit, the less chance that it will come out of the carpet completely. The first thing that you want to do after spilling printer ink or toner is to scoop up as much excess liquid as possible. Pushing loose liquid down into the carpet can actually push the stain deeper into the fibers, so first try scooping up large puddles with a spoon. Next, take the roller brush off of your vacuum and try vacuuming the rest of it away. (However, be sure to clean out the bag/canister of the vacuum immediately after so particles are not redistributed into the air.) Once you have cleaned up as much excess liquid as possible, move on to blotting. When dealing with a liquid ink or toner spill, you want to make sure that you avoid scrubbing the carpet as much as possible, as this can destroy the fibers and spread the liquid into new areas. Instead, moisten a cloth with dry-cleaning solvent and water or clear dish soap and water, then blot the area. You will begin to notice that the liquid slowly transfers onto the cloth. Continue to do this with new sections of the cloth (to keep toner from reapplying onto the carpet) until the stain is completely removed. However, if the stain is still not releasing, try a more aggressive method. There are a couple more aggressive cleaning methods that you can try if you have a stubborn stain that won’t come out with soap and water. However, make sure that you test these methods on a small area before using them on your whole carpet in order to prevent damage. 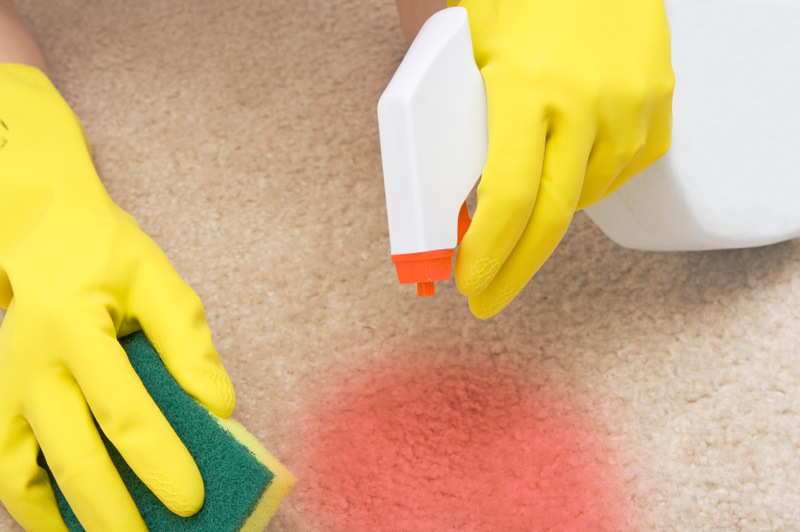 Rubbing alcohol can help to remove aggressive stains, but should be used lightly as the alcohol can break down the carpet glue if it touches the backing. If you have light or white colored carpet, hydrogen peroxide can also help to remove ink and toner. However, this method can have a bleaching effect on dark colored carpet. Once the stain has been completely removed, allow the area to dry thoroughly. You can also place a tower over the damp area to help absorb and excess moisture. Once the carpet is dry, you can also vacuum over the entire effected area in order to restore the texture of the carpet back to normal. Voila! There you have it―no more stain. Do you have any more tips or suggestions for removing difficult stains such as those caused by inkjet cartridges or toner cartridges? Be sure to leave them in the comments below!